Welcome to the Cornell Art Museum, the premiere destination for contemporary art in Palm Beach County! –TripAdvisor / Read Our Reviews! The Cornell Art Museum strives to show nationally and internationally recognized, contemporary artists who create innovative and provocative works of art. Inquisitive visitors enjoy intriguing pieces of artwork while discovering new artists and styles. The Museum exposes the greater Delray Beach and South Florida communities to artwork that is culturally relevant and exciting, hoping to foster creativity and inspire imagination. Museum shows typically begin with a theme and blossom into dynamic group exhibitions that excite visitors from all backgrounds. Photograph by Julia Rose Photography: artwork by Speedy Graphito, part of the Tech Effect exhibition. In 1985, a group of concerned citizens, spearheaded by then Delray Beach Historical Society Vice President, Frances Bourque, established a task force to save the buildings and recapture some of their historic meaning. In their view, this four-acre site, containing the two classroom buildings with a 320 seat auditorium and gymnasium, had great potential as both an important historic preservation project and an arts center benefiting Delray Beach and the surrounding communities. It was also thought that the restored buildings could jumpstart a plan to revitalize the struggling downtown, which had an occupancy rate of just over 30%. In 1990, the 1913 elementary building had been completely restored as the Cornell Museum of Art and History; and the exterior restoration of the original high school building was also completed. In 1993, the restored Crest Theatre opened its first season. 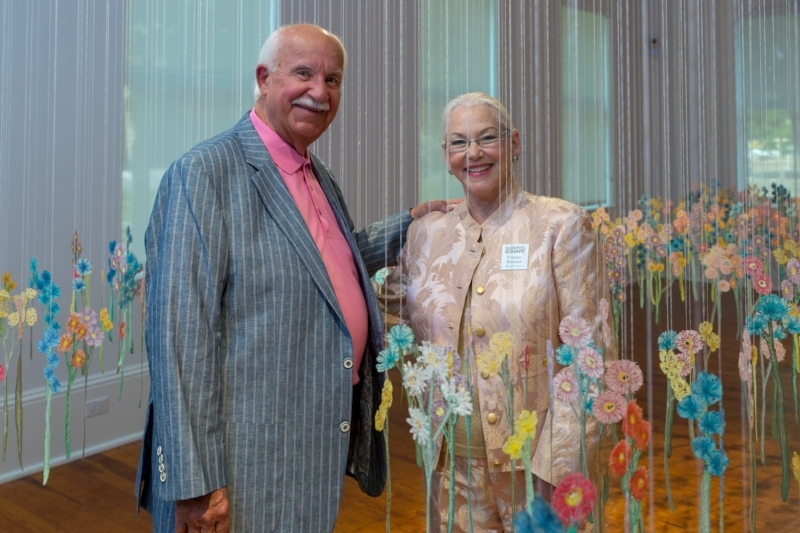 Photograph by 4th Avenue Photography: Bob and Frances Bourque enjoying the FLORA opening celebration. March 2018. There are countless ways to get involved with the Cornell Art Museum. Our docent opportunities are open for those seeking an art infused environment, who love interacting with the public and are interested in sharing the history of our historic site. We love docents of all ages! Must be engaging, smiling, and willing to help support the Museum Staff! The Cornell Art Museum is part of Old School Square a 501(c3) registered non-profit cultural arts organization. Old School Square is the center of arts & entertainment in downtown Delray Beach and has served as the community’s gathering place for over 25 years. Help keep us serving the community with any donation. Every penny counts!